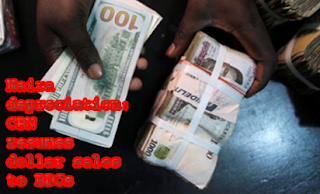 The Naira has continued to depreciate despite the increase in the nation's foreign reserve, reports newsmen. The Nigerian currency lost three points to exchange at N510 to a dollar on Wednesday after closing at 507 on Tuesday. While the pound sterling and euro exchanged at 625 and 535 respectively. Trading at the Bereau De Change window saw that Naira traded for N399 to a dollar, while the pound sterling and euro traded at 625 and 537, respectively. At the inter bank window, the Naira traded at 305.50 to the dollar. Tradersat the market attributed the current onslaught on the Naira to speculators and currency hoarders.